Job shadows are hands-off experiences. Generally they last from a couple of hours up to one day and are designed so students can observe someone at work in a specific career field. Students do not perform work during a job shadow experience, nor do they receive any compensation. Internships usually combine hands-off and hands-on experiences (although there are exceptions to this associated with state and federal regulations). Internships may be paid or unpaid, and they are structured to help demonstrate practical applications for academic learning. A tour can be one-on-one (student and guide) or a group experience. It generally involves a guided walk-through of a facility or business, with the opportunity for the student to ask questions of the guide. Informational interviews are one-on-one conversations with an experienced employee in which a student interested in that field of work can ask questions. These interviews can help a student determine if a place of business might be a good fit for a longer-term opportunity such as an internship. Extended Learning Opportunities (ELOs) allow New Hampshire students to earn credit through learning experiences that happen outside the traditional classroom. Some ELOs require NH Department of Labor (DOL) approval, depending on how they fit into the above definitions. When in doubt, call the DOL at 603-271-0127. They are happy to answer questions. Use business language when talking with employers about placing a student. Nothing confuses employers more than language that is unique to education or the workforce development fields. This article from the National Collaborative on Workforce and Disability (NCWD) explains more: Strategies for Youth Workforce Programs to Become Employer-Friendly Intermediaries. Learn to facilitate disability inclusion in your community. These disability inclusion training materials and tips from the Corporation for National and Community Service may be helpful. 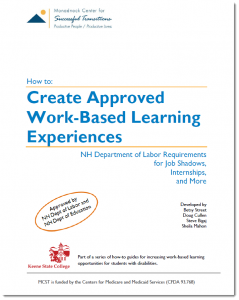 Create Approved Work-Based Learning Experiences will help you navigate the NH Department of Labor process for obtaining approval for work-based learning experiences. It contains step-by-step instructions for the two required approval processes. Included are examples of forms and letters, career objectives, and an overview of child labor laws. Approved by both the NH DOL and the NH Department of Education. PDF, 54 pages, 2010. From the Monadnock Center for Successful Transitions. The federal Department of Labor’s Office of Disability Employment Policy (ODEP) and the Corporation for National and Community Service (CNCS) developed a guidance letter on volunteerism and service learning as a pathway to employment for youth, including youth with disabilities. It’s a good summary of current studies of the benefits of volunteer and paid work in high school, plus information about income exclusions for service-learning stipends that are available to Social Security disability beneficiaries participating in AmeriCorps programs. Work-Based Learning Opportunities for High School Students (PDF, 84 pages, 2013) provides a conceptual base for work-based learning as a strategy that helps students apply academic and technical skills and develop employability skills. The authors scanned the literature, visited high schools, and produced detailed descriptions of current work-based learning practices to help educators and policymakers understand how work-based learning operates in the United States. Timeline of work-based learning experiences (PDF, 1 page) Kindergarten through adulthood, from the National Technical Assistance Center on Transition (NTACT). © 2018 Next Steps NH. All Rights Reserved.